Array. En fait, le livre a 304 pages. 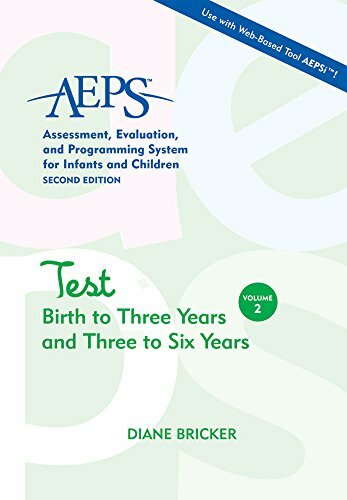 The Assessment, Evaluation, and Programming System for Infants and Children (AEPS), Test: Birth to Three Years and Three to Six Years est libéré par la fabrication de Brookes Publishing. Vous pouvez consulter en ligne avec Assessment, Evaluation, and Programming System for Infants and Children (AEPS), Test: Birth to Three Years and Three to Six Years étape facile. Toutefois, si vous désirez garder pour ordinateur portable, vous pouvez Assessment, Evaluation, and Programming System for Infants and Children (AEPS), Test: Birth to Three Years and Three to Six Years sauver maintenant. View our recorded webinar: Reliable Assessment and Effective Programming with AEPS presented by Kevin Warg. While children and their caregivers engage in everyday activities, professionals assess each developmental area using the AEPS data recording forms. Each item is scored with a 0 (does not pass), 1 (inconsistent performance), or 2 (passes consistently). To supplement and clarify these scores, professionals choose from 5 qualifying notes and use the blank space provided for more specific comments. With this multipart scoring process—and the input caregivers add with the revised Family Report—the AEPS Test lets professionals pinpoint what children can do, identify areas that need attention, and use that information as a starting point to develop individualized IFSP/IEP goals and objectives. This volume is part of the bestselling AEPS system for children from birth to six years who have disabilities or are at risk for developmental delays. Thousands of programs across the country rely on AEPS for comprehensive, seamlessly linked assessment, evaluation, intervention, and programming. AEPS is criterion-referenced and curriculum-based, and with web-based data management through AEPSi™, it's easier than ever to assess young children and ensure that they make real progress. Auteur: Diane Bricker Ph.D., Betty Capt "Ph.D. OTR", Kristie Pretti-Frontczak Ph.D., JoAnn Johnson Ph.D., Kristine Slentz Ph.D., Elizabeth Straka "Ph.D. CCC-SLP", Misti Waddell M.S.